Not, obviously, your ideal VACATION weekend, but just your ideal, normal, staying around home, weekend. 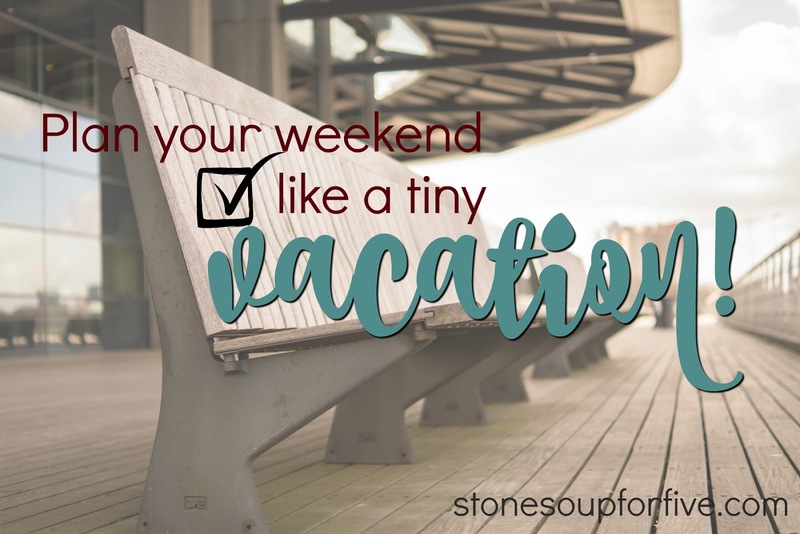 Make a list of maybe the top 4-5 things you would love to do on a weekend that you would make it ideal. Look over your lists and see what you can do during spare or wasted moments during the week... like the times waiting in the car (write a grocery list or menu), or time spent watching TV or on social media. Use those gap times, the "lost" moments, to prep for your weekend and make it something amazing that you and your family look forward to! Think of all you could do if you were intentional about working hard to free up those tasks that usually default to the weekend. Plan your weekend today, like it is going to be a tiny vacation. Work hard and with intention for the rest of this week to make the weekend something special and restful. So let's hear it. What is your ideal weekend? Tell me at least ONE TO-DO and ONE TO-NOT-DO for this weekend and what you can do to make it happen!